But is the picture a true one? Is there any basis in fact for it? No, says the Chemical Warfare Service of the United States Army. After more than twenty years experimentation with every kind of poison gas known to science, the nation’s acknowledged authority on the subject has come to the conclusion that gas is the “bogey man” of war. Uncle Sam’s chemists, convinced that the public has a right to know the real facts, even go so far as to say that as much as 12,000 tons of mustard gas, most devastating of all war time gases, could not possibly wipe out a big city’s population. Not once in history has an aerial gas attack ever been launched against a city. While this method undoubtedly will be tried in the next war, such an attempted slaughter of defenseless millions actually is no more and no less than a fantastic dream. Even in the World War, with hundreds of thousands soldiers massed in open fields, apparently perfect targets for aerial gas attacks, this method was not as destructive as other weapons of war. To prove this conclusively to the skeptical-minded, the Chemical Warfare Service cites these facts and figures. As little as 20 milligrams of mustard gas absorbed into the lungs will cause death. At first glance it would seem, therefore, that 12,000 tons of this chemical could wipe out a third of the population of the United States. However, this quantity of mustard gas was actually used during the World War. True it incapacitated 350,000 men. But only 2.5 per cent of them died. Thus it took an average of a ton of gas to injure every 29 victims and a ton and a half for every death! There is a very simple reason why most poison gases are not more destructive and that is because weather conditions tend to reduce the harmful chemical effects to a minimum. A wind blowing at the rate of only four miles per hour, for instance, can move a huge cloud of deadly gas from a given region at the rate of 352 feet per minute. Result? Much of the chemical will be carried away over the heads of the people intended to be destroyed. From the military standpoint, according to army experts, a gas attack on a city would scarcely pay. And in the case of such a contemplated attack the pure gases would be out, for obvious technical reasons. Take phosgene gas, for instance. This gas must be released from the ground and in great clouds to produce any material results. 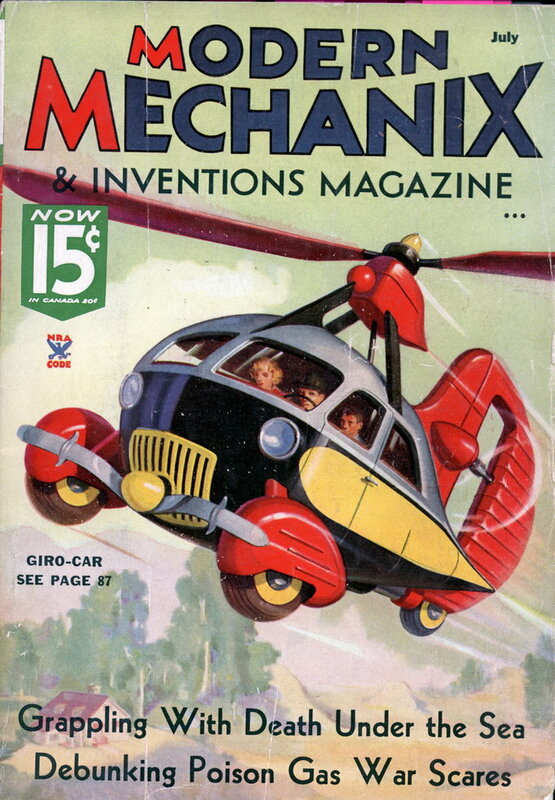 The airplane is not adapted for this. It can drop a cloud of smoke which hangs for a few moments while hiding some important operation. But the dispersion of lethal gas in this fashion is physically impracticable. Nor can gas bombs be used. Simply because it would be impossible to concentrate enough gas to justify the action. In the case of an aerial gas attack only liquid chemicals are of much value. And in making an attack on a city with a liquid sprinkler it would be necessary to fly low. Towering city buildings would preclude such an operation and the canyoned depths would never be reached. In fact the low flying planes would be shot down by anti-aircraft guns before the attack got well under way. Lewisite, the deadly gas developed after the World War, a dark green fluid, might be dispersed in some fashion over a city and down into the streets. But water would quickly wash it and its poisonous vapors away. Should the gas rise from the ground, it would scarcely drift above second floor windows. When poison gas was introduced by Ger many into the World War at Ypres, the German General Staff was informed by chemists that the war would soon come to an end. Chlorine, a deadly poison, when released before the Allied position was expected to drift across “no man’s land” and rout the enemy from its position. Once in the open the German troops would everwhelm the British and French. True the gas barrage was successful. But the Germans never followed up the attack with troops. To the Chemical Warfare Service this experience of the Germans at Ypres with chlorine suggests the impracticability of its use in an aerial attack. Mustard Gas Is Most Dangerous Searching through old records belonging to large-scale commercial chemists and utilizing the world’s most complete data on some 250,000 chemical combinations, the chemical engineers of the warring powers from 1916 to 1918 sought a perfect gas. The net result of a couple of years search was mustard gas, and it is doubtful, most chemists of today are convinced, if any other gas will ever be discovered with more effective qualities as an attack chemical. Phosgene is no more deadly but is the lightest of all the gases and therefore requires enormous quantities for purposes of destruction. Phosgene is volatile, but not as volatile as chlorine. Therefore phosgene cannot be classed as a real lethal threat to civilian populations in time of war. Simple Mask Needed for Chlorine Since the simplest mask is protection against chlorine, the general public need not fear it as an important agent of destruction. Chlorine will kill vegetation on a large scale but salt will do a better job and far less expensively. Mustard gas is not very volatile. It is a persistent agent which affects the lungs very much like phosgene and is deadly on long exposure to it. The real threat offered by mustard gas lies in its liquid form. When scattered on the ground it gives off a suffocating vapor. Both the vapor and the liquid burn. So that proper protection against mustard gas necessitates the use of gas-proof and fire proof masks and suits. Fluorine, a newly heralded war gas, has no application to war either as an explosive or poisonous gas. Its effects cannot be controlledâ€”that is, its time of explosion cannot be ordered. Though lethal properties are claimed for fluorine, this chemical is too light for field use. One of the first things to bear in mind when you hear wild remarks about large-scale “gassing of cities and civilians,” according to the experts of the Chemical Warfare Service, is that, as yet, no aerial gas attacks have ever been made. There were none whatever during the World War. In addition to overcoming such defenses against air raids as aircraft guns, attacking planes, smoke screens and dirigibles, it is absolutely essential, in launching a successful gas attack, to have almost ideal conditions of wind and weather. Night time affords the most desirable conditions for a gas attack. During the night or in the early morning hours, strong winds and ascending air currents are at a minimum. Foggy and cloudy weather are advantageous in keeping the gas on the ground. Heavy rain almost always washes out the destructive effect of poisonous vapors, while woods, grasses, bushes, trees and buildings serve to retard their movements. Aerial Gas Attacks Unlikely All these things point to one rather obvious fact and that isâ€”most aerial gas attacks are doomed to failure. Where civilian populations are concerned, training of every man, woman and child is urged by most of the world’s leading powers. In Europe danger from gas attacks is considerably greater than in our section of the world. There great and powerful states, regarding each other distrustfully have more reason to be fearful of sudden aerial gas attacks. Here, on the other hand, we have peaceful neighbors on the north and south and oceans on the east and west. It is not surprising therefore that in the great centers of Europe the public is taught protection against all types of poison gas. Especially devised masks and suits are being tried out on a large scale. In Berlin and other great national centers, enormous underground tunnel networks have been constructed to which the civilians may retire, not only from aerial gas attacks but from aerial bombing as well. In this country there is little occasion for preparation, the Chemical Warfare Service contends. Certainly there is no reason for alarm about our cities being wiped out by a gas attack from enemy planes. In the first place thousands of planes would be necessary to accomplish the attack. And, in the second place, from a military standpoint an aerial onslaught of this sort would be of questionable value. 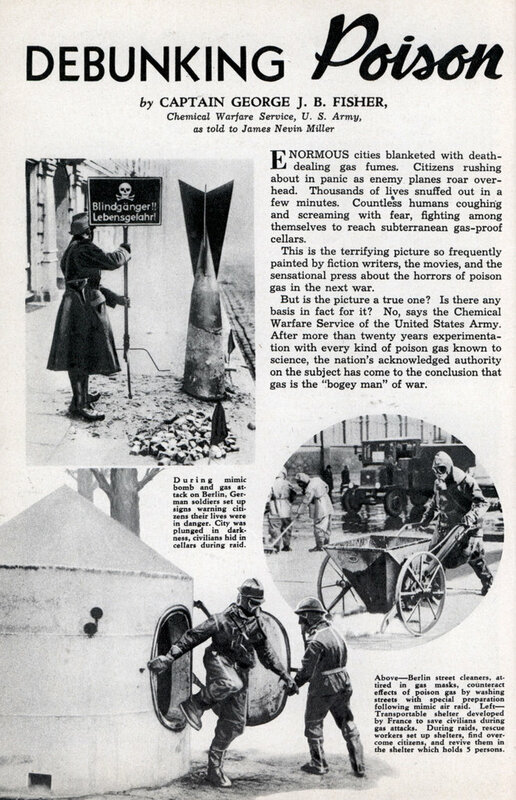 I just love the chemical warfare hype of the interwar years 🙂 And to think that except for the Sino-Japan war, no gas was actually used in the WW2. Predicting the future of war has always been a tricky business. Nicolas: Calling it hype is 20/20 hindsight. Besides the theme of this article is actually anti-hype. Gas in WW I was more of a terror weapon than casualty producing. So you had a lot of survivors of gas attacks live to tell the tale and in the retelling was probably where threat outstripped reality. One of those survivors was Adolf Hitler who ordered no first use of chemical weapons in WW2.